Panchakarma is a medical treatment and should be administered by a medical professional to ensure the safety and well-being of a patient’s health. Panchakarma is the ancient system of Ayurvedic detoxification and rejuvenation therapies designed to facilitate the removal of deep-rooted stresses and toxins in the physiology. Ayurveda recommends these cleansing therapies up to three times a year--at the change of seasons--in order to maintain well-being in healthy individuals or to restore balance in those experiencing illness. The purpose of panchakarma is to extend the lifespan. By undergoing panchakarma on a regular basis muscle tissue, bone, immune function, digestive function, nervous tissue as well as teeth and hair (upadhatus or "secondary tissues") can be maintained, essentially adding years to one's life. Today, even modern science estimates that longevity is determined 30% by one's genetics and 70% by lifestyle choices. Many diseases of modern times are caused by these deep-seated toxins which lead to improper digestion, stress, lack of sleep, anxiety, loss of concentration, premature aging, heart disease, diabetes, hypertension, cancer, neurological disorders, chronic fatigue, osteoporosis, sexual disorders, allergies, and unhappiness. Panchakarma utilizes a set of therapeutic procedures which are given in a specific order to promote the elimination of toxic substances out of the body via the nearest possible route of elimination. The resulting purification results in the intrinsic up-regulation of the body’s capacity to cure itself of many conditions and diseases. But Panchakarma has value not only as a detoxification procedure (shodhana) in the treatment of disease, it is also effective as a preparatory measure to strengthen a patient (brihmana) prior to surgery, as a means to promote weight loss (langhana), to increase the effect of rejuvenatory medicines (rasayana), prior to libido-improving procedures (vajikarana), and before the administration of certain special medicines (kshetrikarana). In all of these uses, panchakarma accomplishes the removal of toxic accumulations and the return of the doshas (psychosomatic energies) to normalcy and balance. Not every patient will require all therapies at any given time. Which of the many auxiliary procedures a patient is to receive is decided according to the season, climate, diet, emotional state of the patient, the knowledge and understanding of the physician, the length of treatment, in addition to the prakriti (constitution) of the patient. Every treatment is individualized to meet the needs of each individual, including herbalized oil selection, pressure, pace, marma points used and intention. 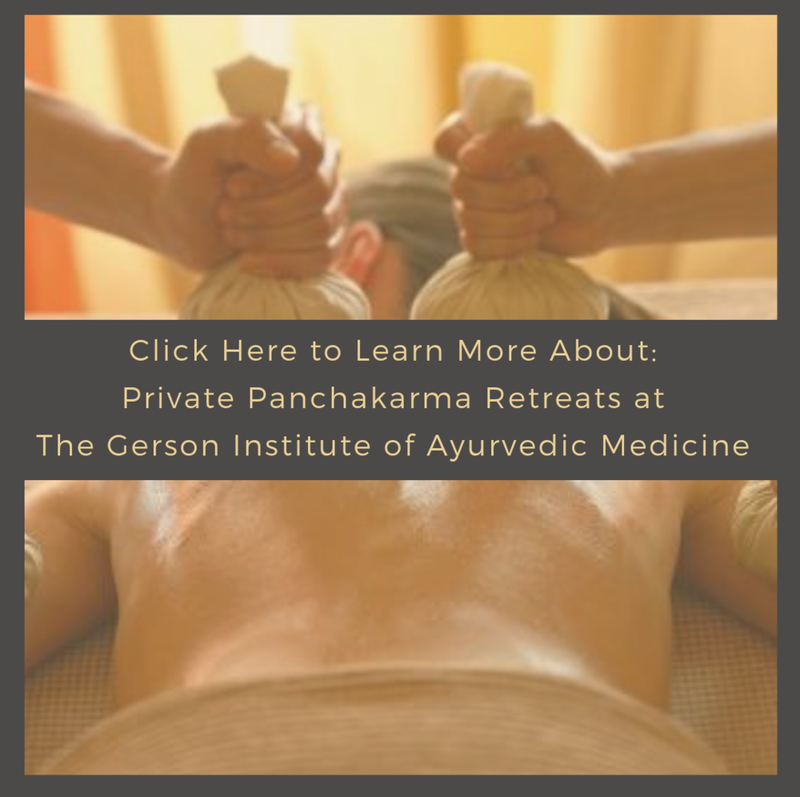 All therapists at The Gerson Institute of Ayurvedic Medicine undergo extensive training with Dr. Gerson and his senior panchakarma therapists and most have been performing these therapies under his guidance for more than 10 years. To learn more about Panchakarma, we have included the following articles: Introduction to Panchakarma and Panchakarma Longevity. "This Panchakarma retreat was truly a renewal of the body, mind, and spirit. Its now weeks later and I'm still feeling energized and living a more balanced life"
"For me, Dr. Gerson's knowledge, his attention to detail, and the precision of the Panchakarma treatments and diet made the experience authentic and transformative. Thanks from the bottom of my heart."